The mod was developed using a vesta 675 and the pictures are of the same. As the mod really concerns just the connections to the 16510 then the mod should work with any CCD camera using this chip. It is worthwhile making 1 check first though. Using a multimeter see if pins 8 and 13 on the 16510 are electrically connected (0 ohms). If they are not the mod should still work but the control circuit will need a small change (email me smunch@clara.co.uk). If pins 8 and 13 are connected then you are in business. Dismantle the camera and disconnect the CCD PDB. The camera PCB is pretty hardy and seems to tolerate abuse quite well. However do take antistatic precautions and check your work with a magnifier and multimeter to see if any solder bridges occur. The vesta camera PCB has 2 sides. Top has the 3 large IC's and the bottom holds the 16510 (near the ccd pcb connector). 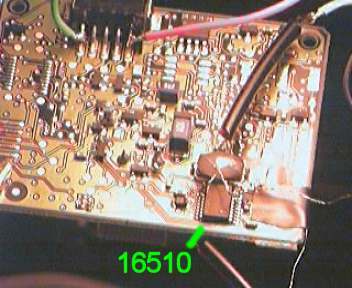 Firstly locate the 16510 and its pin numbering (pin 1 towards the CCD connector side). Now using some solder wick remove the solder from under legs 8,10,and 13. Then using some heat and a small blade (eg jewllers screwdriver) lift these legs. This is really the only bit were you could damage the camera. Lift the legs carefully so as not to snap them. Now solder wire to the raised legs 13 and 8 of the 16510. To achive this without risking adding a large lump of solder, I made very small loops in the wire and added a small amount of solder to these. 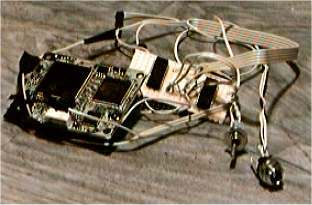 The wire was then placed against the chip leg and heat applied. 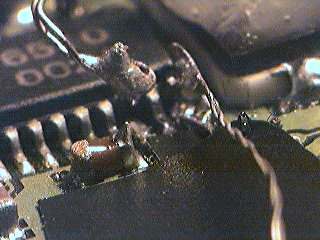 It is very important not to tug on these wires when soldered in case the IC legs snap, so again fix the wire to the PCB. If you don't need the shutter function then the tricky bits are finished. However if you would like to keep the shutter control available then wires also need soldering to pin 10 and the pad below pin 10. Care is needed for this lower lead as there are a number of contact pads on the PCB close to where this lead will run. Try first covering the PCB in this area with insulation tape. The last bit of work on the pcb is to attach wires to the 5V and 0V of the USB connector to power the logic ic's (see pic at top of page, 5V red wire and 0V green). Then all that's left is to connect up all the wires (nb lead B is from pin 2 of printer port) and double check for them solder bridges. To test the camera connect to USB but not printer port. The camera should work as normal except the shutter control will not work. Then download the software on the next page, connect to printer port and try a long exposure. During the exposure the preview window should turn black. 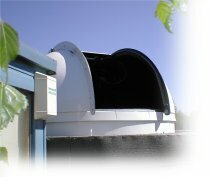 If all this works then WELL DONE you now have a deep sky capable colour webcam!!!!! The finished mod (nb original 2 chip mod showen).